The 'kama' part of the former shrine name corresponds with the kama meaning sickle and chain weapon rather than the kama as in cooking pot. There may well be some connection point between the sickle and the pot/ kitchen hearth being that the pot was curved in a similar way to the bow shaped sickle. This shrine can be seen in the Engishi written with the same characters for Karakama-jinja as are used today. Reaching the shrine takes considerable efforts. After making your way up the steep sides of the valley, rocks will obscure your path, but after dodging through the stones, you will finally get there through a gap in the boulders. 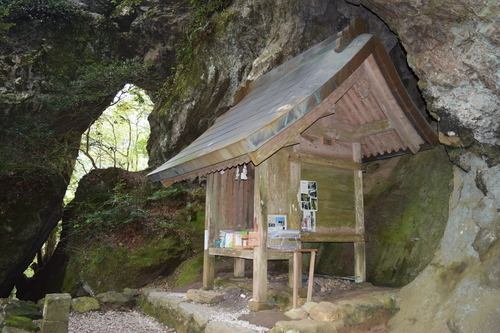 The old form of the shrine even now transmits its pedigree as an iwakura (large rock dwelling of a god). Whenever did the rocks shuffle about, break up and return to their former state? During the constantly repeating process of rocks falling, being broken up by extending tree roots and being collapsed into unusual forms by water freezing up between them, these stones have lived on as sacred beings. It is possible that back in the Nara period when the Fudoki was complied, the rock shapes resembled the kama weapon mentioned earlier. Then by the time the Engishi was written in the Heian period, the place of ritual contained collapsed rocks whose form brought to mind the 'kama' shape of the pot/kitchen hearth. Keeping the Gakuen Community Center on your left, drive through the mountains about 300m. Leave the car and head on through the cedar trees. When you come to a torii gate on the right, you'll see a large rock opposite that goes by the name 'ishibune', said to have been the rock that shrine deity Susanoo-no-mikoto sailed on over to the Korean Peninsula. 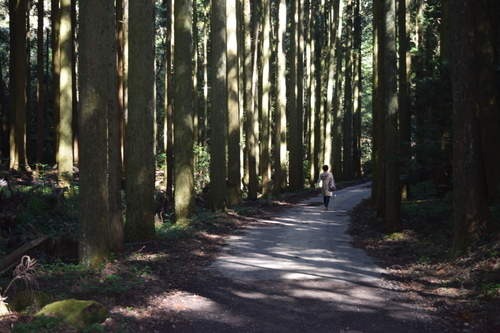 This is near to the start of the ascent up the mountain path that leads to Karakama shine. It is a steep, natural stone stairway and has a rope banister to help you on your way. 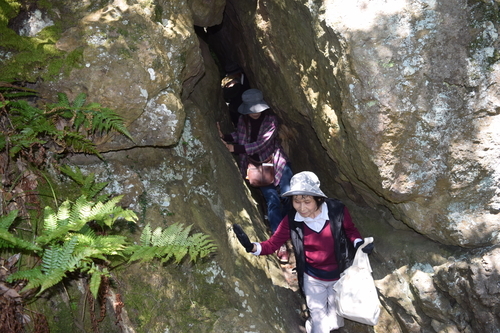 Upon completing the climb, there is a parting in the rocks allowing you to finally pass through and enter the shrine. Although almost buried within rocks, the blue green copper roofing of the structure shines through. I hear there are traces of bonfires left by Shugendou mountain ascetics. Since ancient times, this has no doubt been an ideal spot for quiet meditation for those practicing all manner of beliefs. At present, it is said to bring good luck and safety for expectant mothers, so is visited by many young women. Although the idea of safe birth seems incongruous in a shrine whose deity is the turbulent Susanoo-no-mikoto, if his role in the creation of the country is compared to the idea of the rocky paths of Karakama as a kind of 'birth canal', then the connection may be more imaginable. Considerable care is needed when visiting this shrine as the descent is actually scarier than the journey up. Karakawa town is renowned in the prefecture for its tea (ocha) plantations. So as an alternative to the risk of climbing, looking up to the mountain from the Ochano sato Karakawa kan tea building located past the aforementioned Gakuen Community Center, offers a chance to worship Karakama shrine more safely from afar. For those unable to reach the actual shrine, there is a hall of worship here. This spot, recipient of a prefectural prize for its outstanding scenery, offers a commanding view of the tea fields, reminiscent of those of the famous Uji tea plantations in Kyoto. The tea is on sale at the community center where you can also get an official Karakama shrine hanko stamp.